The actress Hilde Hildebrand had her first successes as a comedian from 1914 at the theater and from 1922 she acted on different stages in Berlin. She made her film debut in the silent movie era and took part in "Die Scheidungs-Ehe" (20), "Es bleibt in der Familie" (22), "Der Trödler von Amsterdam" (25) and "Rasputins Liebesabenteuer" (28). When the talkies replaced the silent movies this marked also the turning point for Hilde Hildebrand's career. With her classic beauty and the touch of profligacy and chic appearance whe became a busy actress in many movies of the 30's and 40's. To her great successes of those years belong "Das Schicksal der Renate Langen" (31), "Bobby geht los" (31), "Viktor und Viktoria" (33), "Die englische Heirat" (34), "Barcarole" (35), "Amphitryon" (35), "Fräulein Veronika" (36), "Der Tanz auf dem Vulkan" (38) and "Bel Ami" (39). Till the end of war followed other important productions like "Der Kleinstadtpoet" (40), "Frau nach Mass" (40), "Jenny und der Herr im Frack" (41) and finally "Grosse Freiheit Nr. 7" (44) - her greatest triumph. The era of great successes was over after the war. Besides her roles for the theater she only appeared in few more movies, among others "Der Herr vom andern Stern" (48), "Kätchen für alles" (49), "Epilog/Das Geheimnis des Orplid" (50), "Die Drei von der Tankstelle" (55), "Die Fastnachtsbeichte" (60) and an episode of the serial "Der Kommissar: Der Moormörder" (71). 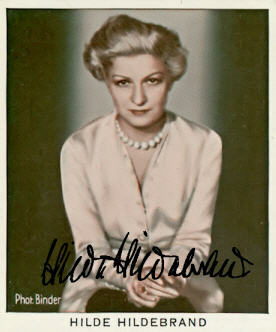 Hilde Hildebrand was awarded with the "Filmband in Gold" in 1964 for her outstanding activity for the German film. Hilde Hildebrand dissociated more and more from public life in her last years and finally died lonely in Grunewald.